The Costa del Sol is a region in the south of Spain and it’s name meaning is quite literally the ‘Coast of the Sun’. The area is made up of coastal towns and the coastline of the Province of Malaga. The coastline stretches for 159 kilometres from Manilva to Nerja. As I was staying near Fuengirola, I would explore from here. Fuengirola is a town on the Costa del Sol and it is best known for it’s sandy beaches. As I was based near here, I had many beach walks and frequented the cafes and restaurants as I have wrote about in the last blog post. Fuengirola is perfect for a relaxing break or family holiday as there is plenty to keep you occupied, there’s even a castle! My top tip is to go to Granier Cafe, I went every morning with my family for delicious baked goods, breads and good coffee!! As the cafe overlooks the beach it is perfectly positioned and extremely popular, to which I am not surprised at all. My first port of call was Mijas Pueblo, it took around 20/25 mins to drive here from Fuengirola. Mijas is a picturesque mountain village with a strong prehistoric past. In 1969 Mijas was declared an “historic artistic village” and it has since been preserved. The ‘pueblo’ area is very Andalusian, it has managed to retain it’s more traditional way of life and you can wander the white washed streets exploring the historic older quarter. There is a real charm about this place! I visited the Sanctuary of the Virgin of the Rock which is one of the main attractions in Mijas Pueblo and it is the focal point for locals during festival time. It is a chapel, now a shrine that was excavated in solid rock. The story is that back in 1536 a pair of children, who were cousins, saw a dove perched on a rock day after day, one told their father who was actually a mason and he began exploring through digging. The tale was that he found lots of religious objects and most importantly an image of the Virgin, who told him to build a chapel in the same place!! You can go inside, however you must be silent and limit your photographs as a sign of respect. Certainly worth visiting. Afterwards I took a stroll of the village, enjoying a sangria in the village square. There are many things to see whilst you are here, including a miniature museum, a chocolate factory, donkey taxis which I couldn’t do as I felt for the donkeys and their well being and the Mijas bullring to mention a few. However the best part has got to be the view, walk over to the viewing point for the most spectacular view of the Costa del Sol Coastline right in front of you, perfect for a great photo!! Parking wise there is a multi storey so no worries about finding a space and the lifts take you up to the village level. La Cala was where I went to next, driving from Mijas Pueblo it took around 25 minutes along the motorway (the A7). It is part of the municipality of Mijas and is situated right beside the beach, it is a tourist hot spot and there are many restaurants, cafes and bars along the beachfront. Olivia’s is here, a restaurant and bar owned by Elliott Wright who used to be in TOWIE (The Only Way Is Essex) which I have previously eaten in and blogged about. La Cala however used to be a small Andalusian fishing village, up until the 1960s when the Spanish experienced the tourist boom. La Cala’s history states it was a place of defence, there are four towers along the coastline, one here, as this was one of the places the berbers attacked. As it was a beautifully sunny afternoon I walked the beach which is very long indeed and stopped for lunch at one of the beach restaurants. During my stay I came back to La Cala to enjoy the beach and it’s boardwalk. 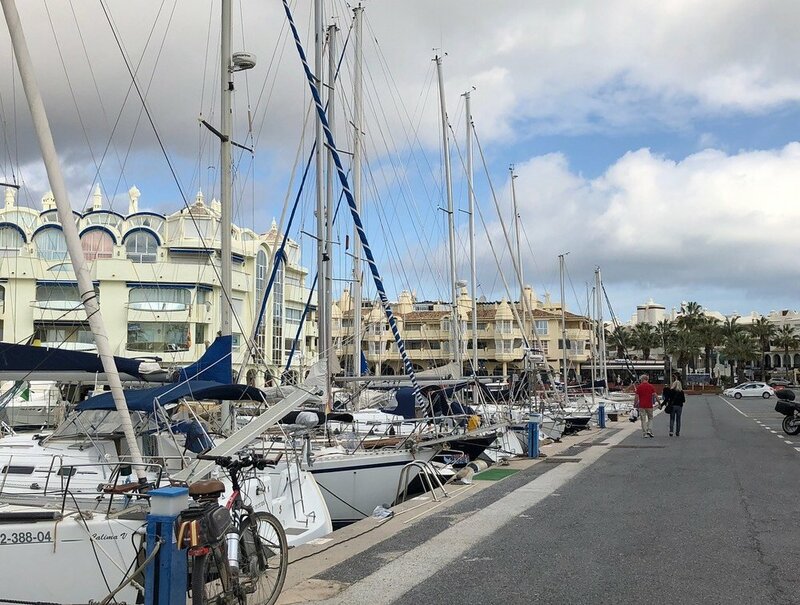 Puerto Banus is a marina which is situated in the area of ‘Nueva Andalucia’ and it’s full name is actually ‘Puerto Jose Banus’ but it is commonly known as Puerto Banus. It neighbours Marbella and is known for the rich and famous to flock on their boats or drive around marina in their super cars! Full of designer shops, cafes and waterfront restaurants, it is definitely worth a look just to see how the other half live!! I wandered around the marina, looking at the impressive array of yachts and as it was christmas and I had some money from gifts I treat myself in one of the shops. Topping off the day with a champagne cocktail overlooking the marina, as the last time I was here was many years ago as a child, I think everyone should come and see Puerto Banus for themselves. Benalmadena was only a ten minute drive from where I was based in El Higueron, so after breakfast on Christmas Day my family and I went to explore. It is a town on the Costa del Sol coast with great beaches, a modern marina and port, as well as an old town. Visitors normally come for their beaches and Tivoli World, or the Sea Life aquarium. I was here to see the marina and explore the town more, as my last visit a couple of years ago saw me take the cable car ride from Benalmadena which is great fun but not for the faint hearted amongst you!! The marina was opened in 1979 named “Port au Prince” however it was changed in 1982 to “Puerto Marina Benalmadena” and it is definitely one of the busiest areas. After enjoying a drink by the marina we walked into town and I was surprised just how many people were around and shops open for a Christmas Day! It was a real pleasure to see these great places along the Costa del Sol and gain a better understanding of each, to give you an idea of what is to see and where you can go if you are planing a trip to southern Spain. 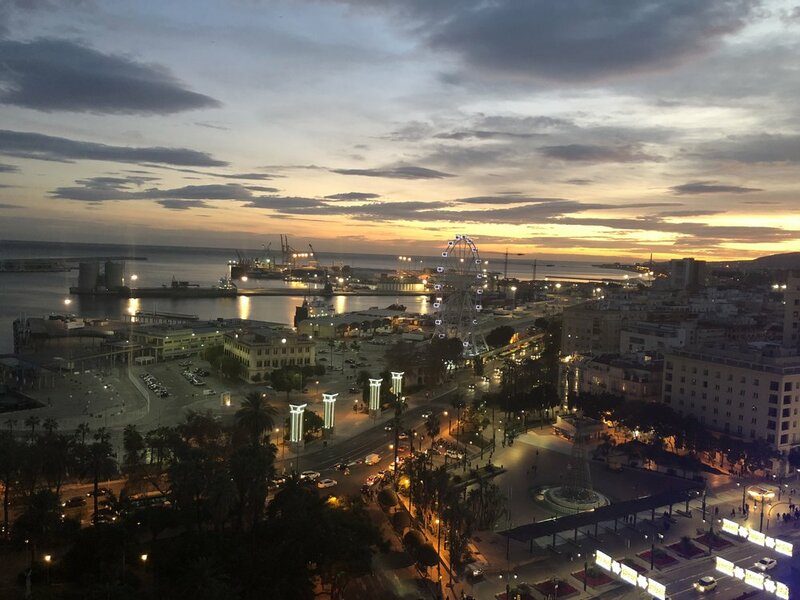 As you will see from my previous blog post I spent the day and night in Malaga during my stay on the Costa del Sol, you can drive to Malaga but I felt it would be easier to get the train there and back as it’s cheap and another experience to be had. Southern Spain has lots to offer everyone, you should add it to your travel lists!